NEW YORK (AP) With key federal funding nowhere in sight for a new $13 billion rail tunnel between New York and New Jersey, project organizers said April 2 they are taking a hard look at whether to shift focus to performing major electrical repairs to the 108-year-old tube. It's an approach similar to the one taken by New York Gov. Andrew Cuomo with New York City's L subway line connecting Brooklyn and Manhattan, which had been scheduled for a lengthy shutdown this year. In January, the Democrat announced a plan to keep the line open by changing the nature of the repairs to the Canarsie Tunnel, which runs under the East River. The Hudson River tunnel, through which more than 400 trains operated by Amtrak or New Jersey's commuter rail service pass each day, is at the center of a bitter dispute between the two states and the federal government over how it is to be paid for. Recently, the Federal Transit Administration gave the tunnel project and an associated rail bridge project in northern New Jersey low ratings that make them ineligible for federal grant funding. Democratic members of both states' congressional delegations have accused the Trump administration of withholding money for political reasons, something federal rail officials deny. Gateway Development Corp. board members overseeing the Hudson tunnel project said that while they remain committed to continuing pre-construction design and engineering work on the tunnel and reaching a funding agreement with the federal government, they have enlisted the help of the same experts from Columbia and Cornell universities who advised Cuomo on the subway project. Both tunnels handle more than 200,000 passengers per day and suffered significant saltwater damage during 2012's Superstorm Sandy. 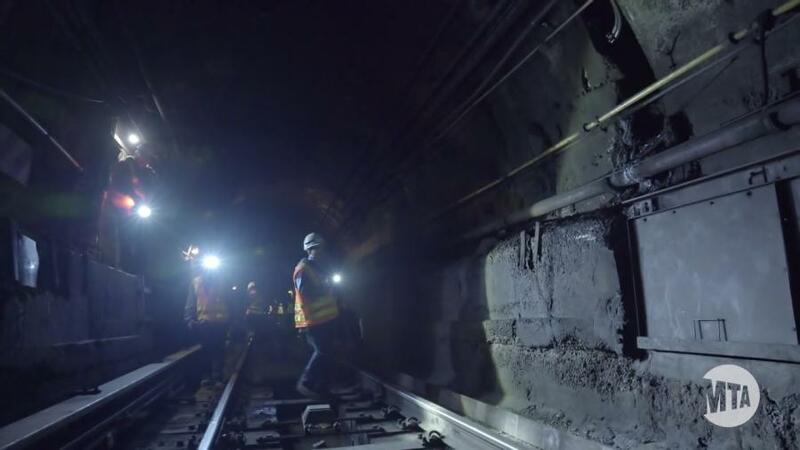 The Metropolitan Transportation Authority approved an initial plan to remove damaged concrete that lines the Canarsie tunnel and encases power cables. The cables would have been replaced and the wall rebuilt. The Hudson tunnel's electrical cables also are encased in concrete that juts out from the tunnel walls. That part of the tunnel bore the brunt of the saltwater damage from Sandy. "We don't necessarily believe that one size fits all," Gateway Development Corp. Chairman Jerry Zaro said. "We have a 108-year-old tunnel and the cables are one issue, but we have many others. Racking sounds interesting, and it definitely warrants exploration and we are doing that, frankly, as we speak." The New York-based Regional Plan Association, an urban research and advocacy organization that focuses on transportation issues, noted earlier this year that the cables in the Canarsie tunnel use 625 volts to power the subway, while the Hudson River tunnel's cables use 12,000 volts and are larger and require more protection. Amtrak already performs maintenance work on the tunnel during overnight and weekend hours but has said that isn't enough to prevent further deterioration that could cause lengthy shutdowns.